The Partners Program will first serve target market segments in the Sports Bar and Restaurant market and in the Casino Gaming industry. “Our partners will also take to market something very unique—revenue generated from Audioair’s advertising program which will include local, regional and national advertising. Durango, Colorado based Airborne Media Group, Inc. announced today that it has launched its Partners Program, which seeks to recruit experienced distributors in the field of high-tech delivery of entertainment media, mobile advertising and interactive social media. The Partners Program will first serve target market segments in the Sports Bar and Restaurant market and in the Casino Gaming industry. Other vertical markets including hospitals, cruise ships, airports and markets with any other venues that have muted television displays because of noise pollution considerations will be approached this summer. AMG has been piloting its groundbreaking Audioair technology in the greater Albuquerque/Santa Fe, New Mexico geographic market. 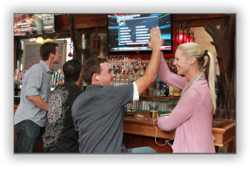 Audioair delivers an on-premise listening system, which makes it possible for mobile device users to select and privately listen in to muted televisions in public environments via the Audioair app. AMG’s free mobile application includes additional features that allow users to receive exclusive promotional offers, interact with the owners of the venue, participate in rewards programs and engage via social media and interactive games such as sports trivia and online casino gaming. Audioair can be downloaded free of charge from the Apple App Store and Android Market. Once downloaded, the application is activated via Wi-Fi connection at an Audioair-equipped sports bar or restaurant. The technology will also be available for use in public venues such as casinos, airports, athletic clubs and hospitals or anywhere televisions are muted. With the use of an ear bud, blue tooth headset or simply by holding one’s phone up to the ear, the mobile device user may privately listen in to television displays which have their audio muted because of noise considerations. AMG Chief Executive Officer Cordell Brown disclosed that the Company is moving into five states along the Atlantic Seaboard in the Southeast U.S. as well as the Dallas/Fort Worth and Austin, Texas geographic markets immediately. He added that Las Vegas, Nevada will be launched in April. Airborne Media Group, Inc. is a privately held corporation founded in 2010. Its newly invented technology is designed to deliver an entirely new entertainment, news and information distribution experience by permitting the users of mobile devices to privately listen in to televisions in all types of venues where they must be muted for noise considerations. The company has created and is expanding a team of strategic and technical partners to further develop its technology and achieve its ambitious sales and marketing goals. Airborne Media Group and audioair™ are trademarks of Airborne Media Group, Inc. in the United States and/or other countries.